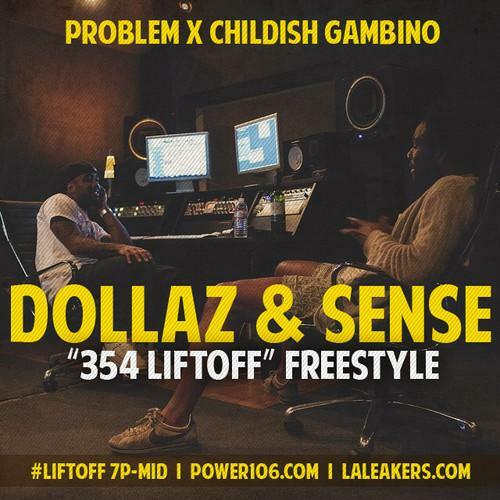 Problem links up with Childish Gambino for a new liftoff freestyle titled "Dollaz & Sense". Problem is getting ready to drop off his LA Leakers-hosted 354: LiftOff mixtape tomorrow, but before he does, hes decided to give fans one last leak from it titled “Dollaz & Sense” featuring Childish Gambino. Tackling DJ Quick’s “Dollaz & Sense”, Chachi & Bino deliver their own rendition of the classic record and trade some costly bars over this hard-hittin' West Coast sounding cut. It follows up on his most recent release “Fancy”, which was released couple weeks ago, and too will live on tomorrow’s Datpiff-released mixtape. Take a listen, and if you like what you hear, hit the download! In other related news, check out Problem on The Game's new monster record "Dont Shoot", and listen to Gambino on Logic's "Driving Ms Daisy", both which dropped earlier today. Thoughts?